This is my newest cross stitch pattern! It was inspired by an episode of the TV show New Girl, where the lead, Jess (or Zooey Deschanel's character), unleashes a tirade defending her inner creative spirit using this phrase. 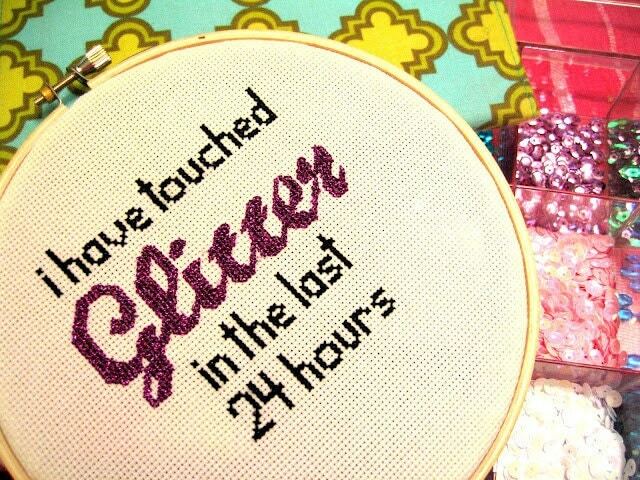 I instantly thought this needed to be cross stitched; not just because I am a fan of the show, but it resonated with me (especially during the Christmas holidays) as I often find myself covered in glitter same as most crafty girls I know! Seriously, I've been mistaken for wearing body glitter to the grocery...no just a craft project and even this past Christmas I had the unfortunate experience of being glitter bombed by my cat as she so awesomely skidded across the table, sending a whole bowl of glitter airborne...landing on me. And I'm not sure if anyone else thinks about embroidery thread obsessively as moi, but I have been searching for a way to use DMC's light effects embroidery floss. A light bulb went off in my head when I heard that phrase and a new pattern was born! The project turned out beautifully; somehow tho, as many pics as I've taken of this, I can't seem to capture how absolutely sparkly the wording is with light effects. It truly is magical! If you would like to stitch your own; I would be so honored...please click here. It's fairly quick to finish up; I give you a complete supply list, color chart, and some tips with working with DMC Light Effects. Plus, once purchased, I am available to you through e-mail as long as it takes you to complete the project. A lot of patterns online (I've noticed) are not stitched out by the designer...I find that odd. I design it, stitch it, and in many cases - redesign it! I just feel that even though it takes longer to get my pattern to market, I know you are getting a better product that will stitch easier and look amazing.